Plums are in season and if this super fruit does not come to mind, you definitely may just be missing out on a wealth of nutrition! Not only do plums taste great, but they are extremely healthy too. 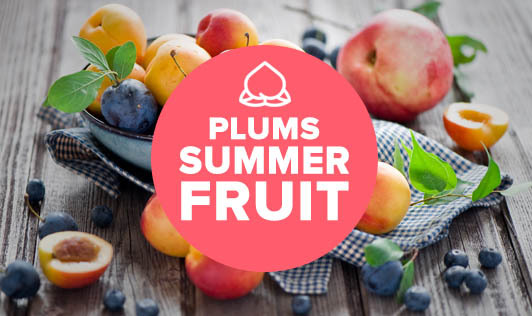 These succulent plums are low in calories and do not contain any saturated fat; however contain abundant health promoting compounds, vitamins and minerals. This fruit is known for its versatility, and you can add it in your bowl of cereal or yogurt, or cook it to make syrup sauces for healthy dessert dishes. - This fruit helps manage high blood pressure and reduce stroke risk. The reddish blue pigment in plums called anthocyanins may protect against cancer by mopping up harmful free radicals. - Plums keep your bowels regular. - Plums help to prevent ear infection. - This fruit ranks low on the glycemic index scale, which means that eating them can help you control blood sugar by further reducing the risk of type 2 diabetes. - Plums boost bone health. - Improves memory. Eating three to four plums a day can help you neutralize cell-damaging free radicals that affect your memory. - Vitamin C in plums helps to strengthen the immune system, build healthy tissues, increase absorption of iron and prevent oxidation related damage. - Plums protect eyes against macular degeneration. - Eating plums protects one from inflammation in the stomach, intestines and colon. This super fruit can be eaten as a fresh fruit or can be eaten as prunes (dried plums). From the list of benefits mentioned above, it's evident that plums are really good for your health. You should try and incorporate this fruit in your diet, at least thrice a week. So, turn to plums and revitalize your body!